SF is a city with hundreds of breakfast eateries but I wanted something special. We walked from our hotel up to North Beach, past old world Italian cafes offering traditional espresso and morning cappuccino but not much in the way of a hearty breakfast. My trusty iPhone pointed us in the direction of a spot on Stockton Street that had terrific reviews. 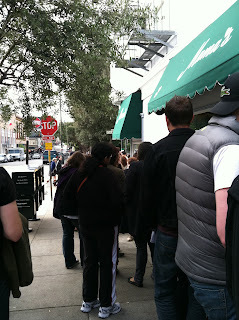 By the line stretching halfway up the block, we knew we had found Mama's. 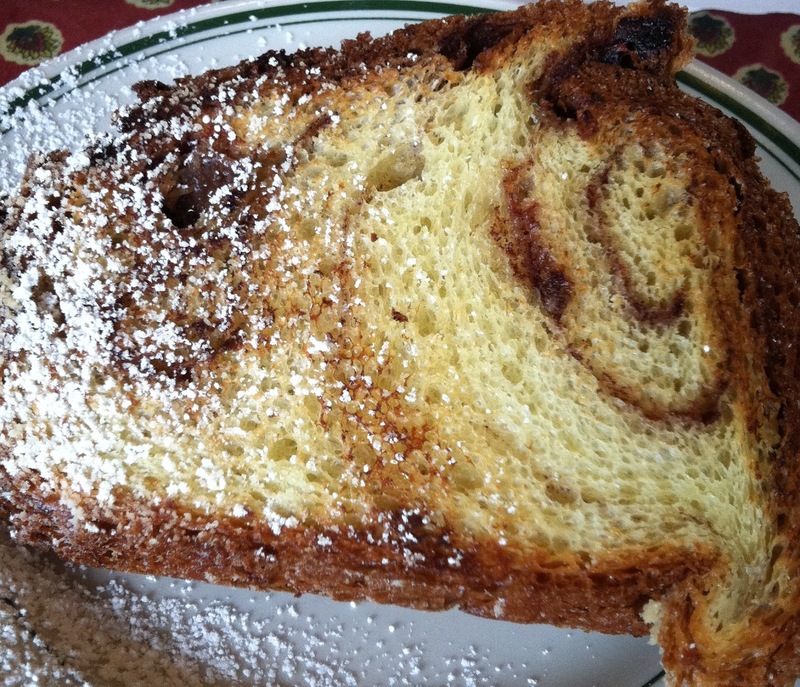 Owned by the same family for over 50 years, Mama's serves up breakfast and lunch every day but Monday. 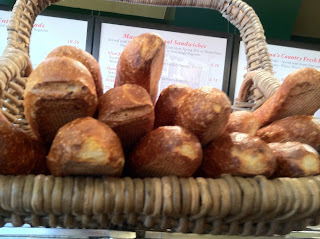 Baking all their own breads and pastries, this place was right up my alley. Throw in an incredible array of breakfast entrees and morning cocktails, and B-I-N-G-O! We waited 1-1/2 hours (no exaggeration!). At one point, my poor, coffee-deprived husband walked 3 blocks to one of the little Italian cafes for a to-go cup. Then three people on line followed suit! My biggest fear was that we would find mediocre food after the interminable wait. Luckily, my fears were not realized. And once you get in the door, it is a rather efficient operation. 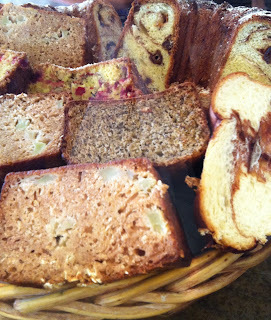 Lining up along the front counter to place your order, you come face to face with baskets of sourdough bread, Kugelhopf, poppy seed bundt cake, and banana walnut loaf, all whispering their siren song. The Sanchez family delivers traditional breakfasts such as French toast and pancakes, and eggs Benedict, but all with a slightly different twist. 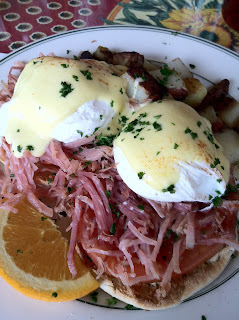 For instance, my Benedict came with prosciutto and tomatoes; my husband's was served with Dungeness crab and spinach. The portions were huge, delicious, and the eggs were cooked perfectly! And being the cake nut that I am, I had to try the Kugelhopf - it came slightly warmed and the waitress suggested I try it with a dollop of their homemade jam, which went perfectly with my Peach Bellini. Mama's was definitely worth the wait! After a nice walk around SF (and a nap), it was time to head to Chez Panisse. 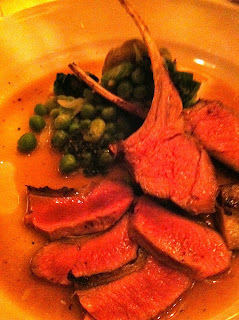 I'm sure most of you reading this blog know all about Chez Panisse and the legendary Alice Waters. So there is probably no need for a history lesson. This allows me to jump right into the dinner details. Promptly seated in the downstairs dining room, which was awash in soft lighting and warm northern California breezes, the top-notch wait staff takes over. Our team of two servers made us feel immediately at home. A delicious aperitif (a bourbon-champagne concoction) was served along with a bread basket. The downstairs dining room offers a set menu so there is nothing to deliberate - Alice has decided for you - the only choices you need make are wine. Our waiter offered to pair wines with every course and each one was a perfect match. The first course was Asparagus salad with Catalan salsa and garden greens. 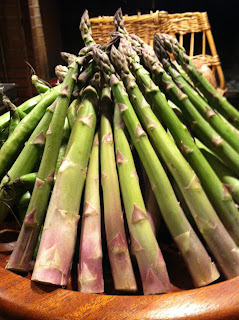 Now, I've had asparagus a million times, and I fully expected this restaurant to shine in the produce department, but I was blown away by the delicious, earthy flavor of these asparagus. And paired with the slightly spicy Catalan salsa, it was just divine. 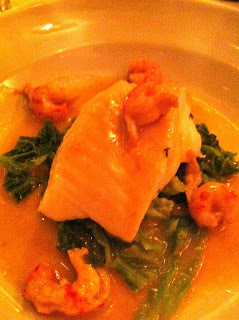 Next, Steamed halibut with Savoy cabbage and crawfish butter sauce. A magnificent combination of flavors. The main course was Roasted rack and loin of Dal Porto lamb with thyme and sage, stuffed artichoke hearts, fava beans, and spring onions. The lamb was perfect, and the vegetables were so fresh, and tender, and bursting with flavor. 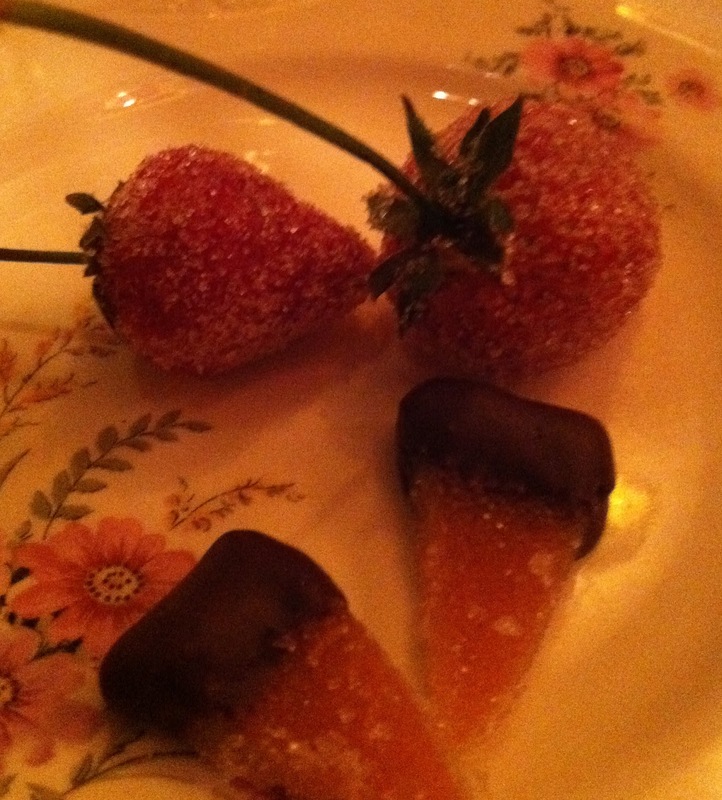 Right before dessert, our waiter asked if I would like to visit the kitchen (uh, let me think about that...). Sadly, Alice was not there that evening, but I had a lovely conversation with the pastry chef as she was plating the evening's desserts. What a treat to be able to see the Chez Panisse kitchen (which is rather small, actually). 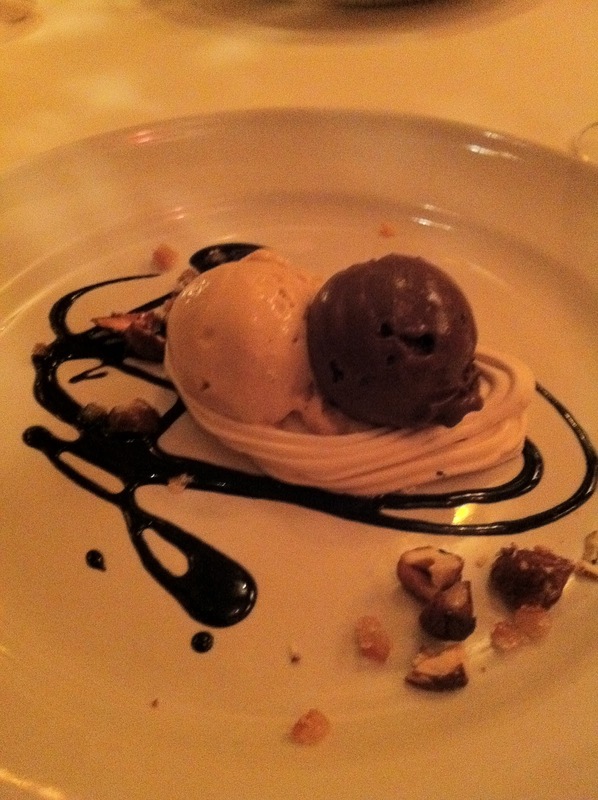 After floating back to the table, dessert arrived. Caramel ice cream and chocolate sherbet vacherin. 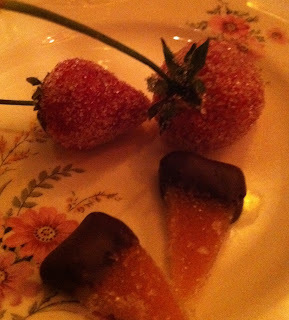 In addition to this delight, the pastry chef sent out miniature, delicate strawberries coated in crystallized sugar and orange slices dipped in dark chocolate. Before our trip, I did copious research on Chez Panisse and read the many opinions on whether this venerable restaurant had lost its' touch. In my humble opinion, it has not. 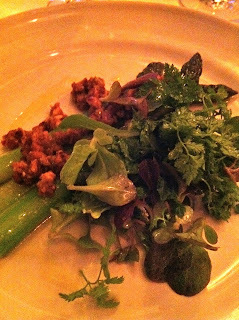 The exquisite food, warm and gracious service, and welcoming atmosphere, puts Chez Panisse in my top five all-time food experiences.